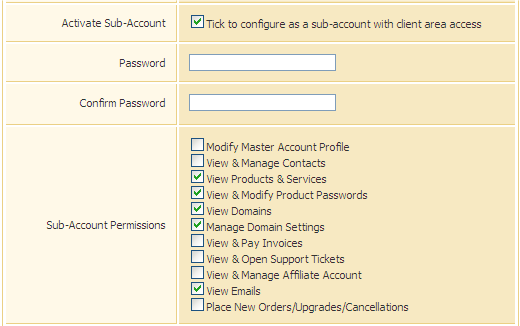 Last week we upgraded the cPanel software which powers our Web Site Control Panel to the latest version, 11.25. This upgrade brings many performance and security improvements and innumerable bug fixes. It also provides a few important new features which we think our customers will find useful. This upgrade also adds a new “Simple DNS Zone Editor” to the control panel, which allows customers to easily create and modify entries in their DNS records. This means that customers who wish to create custom DNS entries can do so without having to get us to do it for them. We have also taken this opportunity to upgrade the Account Control Panel, and beyond the behind the scenes changes there are a few new noteworthy features I’d like to explain. Clients can now create sub-users under their main account to allow multiple people to access the same account without having to use the same login details. We call the primary login the “master account owner”, and any users they create under their account are called “sub-accounts”. Each section of the client area has its own permission setting so the access rights can be fine-tuned by the master account holder (and any sub-accounts which have been given permission to manage contacts), so different people can perform different actions. For example, you might wish to create an account for your web developer to allow them to communicate with our technical support staff without having access to your billing information. The new Mass Payments feature allows you to pay for multiple due invoices in a single payment attempt, which will be more convenient for you and more efficient for us since we will have fewer transactions to process. To use this new option, select the invoices you want to pay from the Dashboard and click “Pay Selected”, or just click “Pay All” to pay all your unpaid invoices. The renewal system has received some attention. It is now possible to renew multiple domains in one go, and it is easier to see which domains are eligible for renewal. I hope you find yourself using these new features. And as always, if you have any comments please feel free to reply to this blog post or drop us an email to feedback@valcatohosting.com.